As a creepy night owl, Stark Skincare’s Neroli Midnight Oil spoke to me, as my bedtime wind-down routine occurs at about 11:15 p.m. This leaves me crawling into bed a little before midnight. No, it doesn’t take me 45 minutes to get pretty for bed. I just tend to dilly-dally before finally committing to slumber (damn you, Pinterest and Instagram! ), but you can bet that I do take my sweet time massaging this neroli-infused nighttime oil into my skin. Stark Skincare’s Neroli Midnight Oil combines knockout ingredients such as camellia oil and evening primrose oil (two of my favorite oils for their scar-fading and acne-healing properties) with precious oils of raspberry, blackberry, pomegranate and black cumin. Talk about a cocktail for your face! Raspberry oil is loaded with vitamins A and E, which help moisturize and protect skin as it repairs itself during rest. Blackberry oil is a natural source of vitamin C, which can help fend off wrinkles and shrink pores. Pomegranate oil improves the skin’s elasticity and is high in lipids, which can help heal inflammation. Black cumin oil, which is rich in nutrients and various actives, can help soothe skin that suffers from acne and eczema. What’s incredible about Stark Skincare’s Neroli Midnight Oil is this is just a fraction of the high-performance ingredients list! 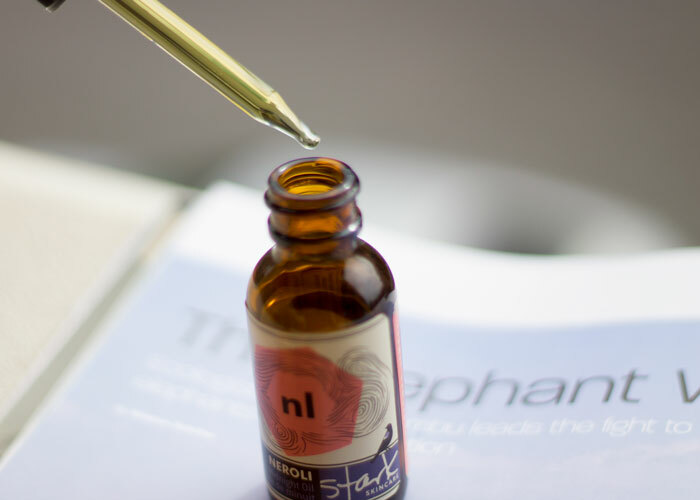 You’ll see that the namesake neroli oil appears near the end, but make no mistake — you get an exhilarating aromatic lift from Stark Skincare’s Neroli Midnight Oil. Stark Skincare founder Jessica Lafleur did not skimp on the neroli! Neroli is known for its ability to calm nerves and anxiety in addition to its scar-healing properties. 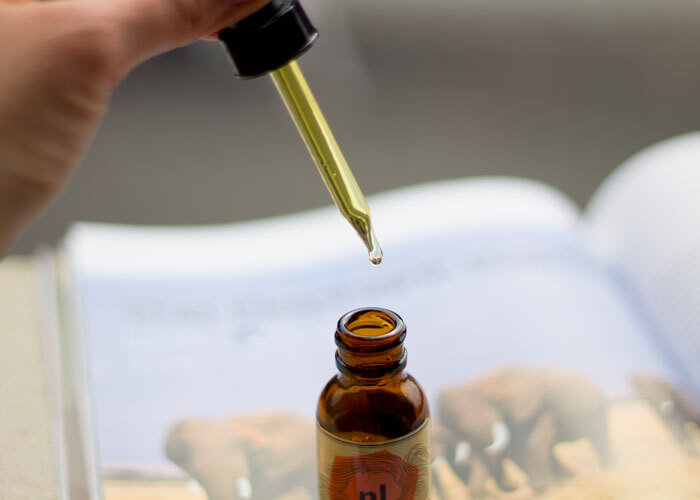 I love that so many ingredients in this face oil focus on scar-healing — bedtime oils that focus on both hydration and repair always win in my book. Upon opening this bottle of face oil, your nose is met with a captivating scent of citrus neroli that’s grounded in a bit of earth and a touch of sweetness thanks to black cumin oil and cocoa butter. It’s got that sort of creamy yet citrusy smell that feels comforting yet uplifting — a perfect combination to lull you to sleep and encourage sweet dreams. On the skin, Stark Skincare’s Neroli Midnight Oil feels substantial. Because it’s designed for evening hydration and repair, it’s not exactly lightweight, but my oily skin took to its medium viscosity well, especially as I focused on massaging it into the drier parts of my face (cheeks) and spreading it down the neck and decolletage, which need all the moisture they can get. With that said, Jessica created Neroli Midnight Oil for those who have mature or dry skin yet are prone to acne or have scarring. 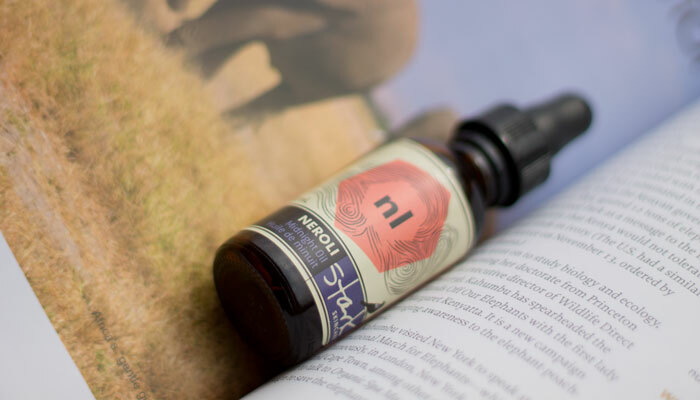 This isn’t a must-have for oily-skinned gals like me, but if you live in a drier climate or experienced half the winter I did here in KC, Neroli Midnight Oil is definitely one to keep around for those weeks when your skin is acting out. I used Stark Skincare’s Neroli Midnight Oil for four weeks during the dead and winter and found it to be extremely helpful in keeping my skin sane. Most times, I have to layer a cream over my oils during harsh winters, but Neroli Midnight Oil was enough for me, especially when applied after spritzing down with a toner (and this is the perfect toner to layer it over — review to come). Bottom line: I’ll be repurchasing Stark Skincare’s Neroli Midnight Oil each winter. I may also toss it in my travel bag for use on the plane — hydration and nerve-calming capabilities? Yes please. Have you tried Stark Skincare’s Neroli Midnight Oil? What are your favorite carrier and essential oils for healing scars and promoting relaxation? Tell me in the comments section!